Today May Be Too Late. This is a post on my blog describing the meaning behind the title of my campaign. Because I started researching information about suicide prevention awareness and looking at old posts I wrote, it awakened thoughts and feelings of the past causing me to become more in touch with my past emotions and feelings of depression and severe mental illness pain. Those feelings will always be a part of me. I will never forget what I have survived over many years of my life. This is not a bad thing, but is a blessing instead. It is always a great reminder of how resilient and strong I am and how far I have come. I am a survivor. I am not depressed at all right now and have not been for over four months, since I overcame my Klonopin withdrawals. Knowing how depression feels will never leave me. It will always be a part of who I am. I can use this knowledge to help others and that is a wonderful blessing. I believe a gift of living with mental illness is being able to understand and feel more. We learn how to become more aware and in touch with deep inner feelings and emotions. Surviving mental illness causes one to feel and experience more and have a better understanding of your inner self, other people and life and death, as well. The gift and blessing of living with mental illness is it gives people the ability to feel and know more from experiences gained from learning how to survive great pain and obstacles. It helps you to become more aware of yourself and others. You must become much more in touch with the human spirit. It becomes a necessity imperative for survival. One of the greatest gifts that people have is the ability to empathize with others. Empathy is a trait that not everyone is blessed with. Empathy is something that cannot be taught. If you are not born with a natural empathy, experiences must form it within yourself, heart and spirit to truly understand the emotions of others. When my postpartum depression overcame me instantly after my daughter was born the most alarming and worst symptoms to cope with were feeling nothing and feeling a huge overwhelming emptiness inside me. I felt removed and detached from myself and others. I didn’t have any emotions. Things that used to make me happy, smile or laugh did not. I didn’t even have anger. I felt nothing. I was empty and void of all emotions. Soon my diagnosis changed to bipolar disorder. Living with bipolar disorder makes you feel more and at much deeper levels and extremes. Sometimes I thought feeling something was better than feeling nothing. Bipolar causes you to feel more than you want to most of the time, bouncing back and forth and around from extreme and varying mood poles of mania or euphoria, and varying degrees of depression, but at least I felt something. Feeling depressed soon became a welcome feeling. Whenever depression visited, at first I sensed a familiar feeling, like an old friend of sorts had come back to visit. Of course, when my depression increased to a severe depression or suicidal depression, it was not a welcome feeling at all and was quite the opposite. There is no light in my darkness. nor a glimmer of hope. my air and life from within me. Darkness swallowed me whole and eventually spit me back out again. Praise God. The beauty of this poem is that even though we as humans can experience and endure this amount of despair, we can also survive it. We can make it through. We can conquer and overcome many obstacles, struggles and illness. We are resilient. We are survivors. The greatest beauty is that there is hope. I am living proof of that. If you are experiencing depression, please know that you can make it through even stronger than you were before. Depression and other mental illness pain will not last forever. Keep holding on. Keep fighting. Keep keeping on. You can make it to the other side and experience joy, love and peace again. You will see the brilliance of the sun shining again. If darkness swallows you whole and you cannot see any light within your darkness, always remember this. You are a shining star, but you just can’t see or feel your own light yet. You cannot see or feel the brightness of your beauty. and you will be the brightest and most beautiful one. that everyone around you will need to wear shades. 800,000 people die by suicide globally each year. That’s one person every 40 seconds. 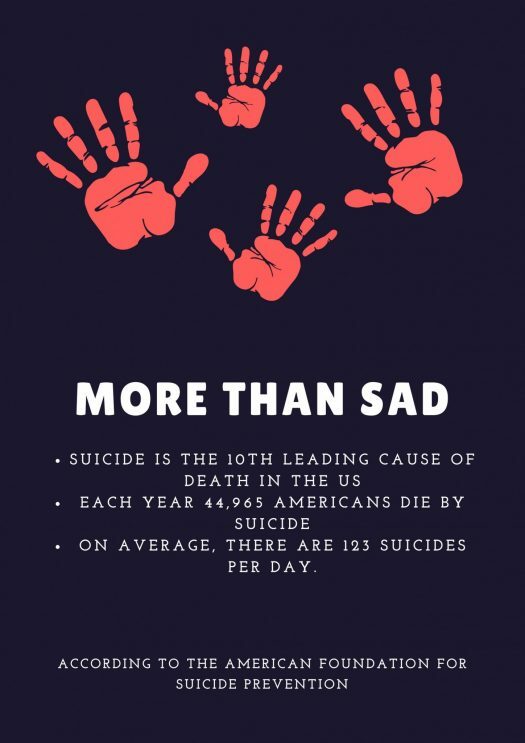 We recently learned that suicide rates in the United States have risen 25% in the last 20 years. In the past decade, the suicide rate among young people ages 10-17 has increased by more than 70%. Suicide is the second leading cause of death among 15-29 year olds globally. The suicide rate in the United States has risen 25% in the last 20 years. Tomorrow needs you to be a good friend. Tomorrow needs you to hold your little sister’s hand. Tomorrow needs you to be an uncle, a classmate, a roommate, a cousin. Tomorrow needs you to laugh. To dance. To build. To dream. Tomorrow needs you to stay for all the things you love. Today needs you to know that it’s okay to ask for help. Today needs you to know that you will get the help you need.